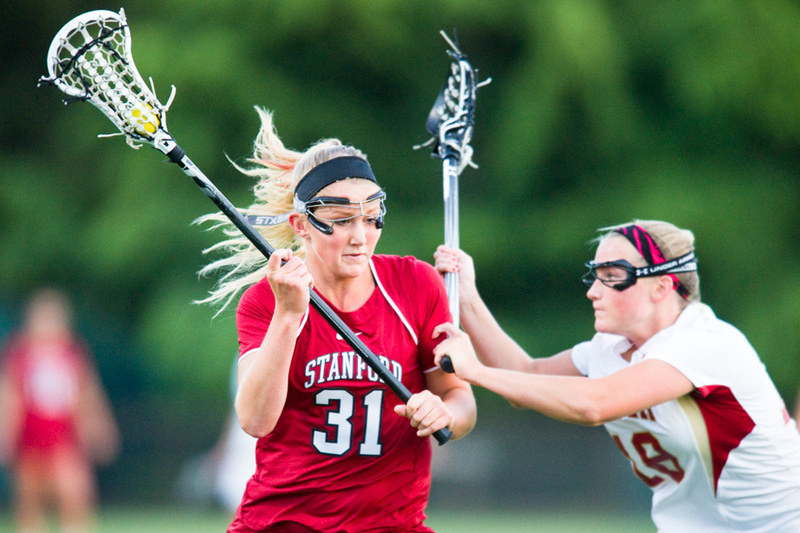 Senior Emily Newstrom scored four goals during Stanford lacrosse’s 22-2 rout of St. Mary’s in the East Bay on Sunday. Megan Zummo of St. Mary’s scored the lone two goals for the Gaels as Stanford improved to 9-5 and 5-0 in conference play, while St. Mary’s fell to 0-12 overall. In all, 15 Stanford players recorded either a goal or an assist, and 14 scored. Redshirt senior Rachel Ozer, playing just a few minutes from her home, notched a goal and an assist in her final homecoming. There are now nine Stanford players averaging better than one goal per game. The victory was Stanford’s 28th straight win over St. Mary’s. Twenty-eight Cardinal players saw playing time, and, as the score indicated, the Cardinal were dominant in every facet of the game — the Gaels were shut out for almost the first 30 minutes of the competition. Laura Klein got her first assist of the year and Sandy Smith recorded her first points of the season with a goal and an assist. The Cardinal will resume conference play on Friday against San Diego State (4-2) and on Sunday against USC (6-0). The clash against USC, which is also undefeated in conference, will be both an important game for Stanford and a Senior Day for Hannah Farr, Kyle Fraser, Rachel Kalick, Meredith Kalinowski, Emily Newstrom, Rachel Ozer and Chinna O’Suji. The winner of the USC-Stanford matchup will be the front-runner for the No. 1 seed in the conference tournament, which in turn will determine which team will go to the NCAA tournament. The game will take place at Stanford’s Cagan Stadium at 3 p.m. Contact Nicholas Radoff at nradoff ‘at’ stanford.edu.